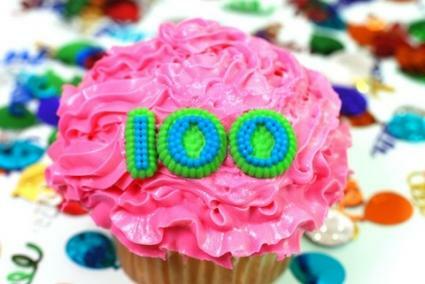 Serve 100th day of school cupcakes to students in your child's class as part of the fun celebration. The 100th day typically falls between winter and spring break, making it a fun occasion for students between the holidays. Cupcakes are an excellent choice for serving to school children. They are easy to transport and require no cutting or utensils. However, some schools have rules and regulations regarding baked goods and other foods brought into the building for students. Check with the teacher or elementary office before bringing in goodies, as you may need to follow nutritional guidelines when baking them. Some schools do not allow homemade foods at all, making it necessary to place an order with a bakery. Regardless of whether you bake the cupcakes yourself or place an order with a local decorator, plenty of fun ideas are available for these celebratory cupcakes. While many ideas for these cute confections are centered around the number 100, there are plenty of other ideas that are just as appropriate for the day. Frost each cupcake in the school colors and then arrange on a cake board in the shape of the number 100. Pipe small 100s using buttercream frosting on the top of each cupcake. Create 100 figures using fondant or gum paste and place on top of each cupcake. Alternatively, pipe out 100s using royal icing on waxed paper, allow them to dry, and carefully stand them on the top of the cupcakes. Keep in mind that just because the number 100 is the theme of the day, it does not mean you need to bring in 100 cupcakes for the class. The number can be conveyed through cupcake decorations, not necessarily by the amount of cupcakes included in the design. However, if you are making 100 of the cupcakes, consider numbering them from one to 100. Arrange them in 10 by 10 rows, making a nice display of the numbers. Consider using different piping colors for odd and even numbers. Frost each cupcake individually to represent the face of the mascot if it is an animal, pirate or other character. Purchase cupcake toppers or small edible images to place on top of the cupcakes if you do not have time for decorations. When the mascot is hard to convey in frosting, consider writing the school name or monogram on the top of the cupcake in school colors. A simple decorating technique that reflects school spirit is to pipe frosting in the school colors. Put a large swirl or rosette tip inside a piping bag. Then dip a small paintbrush used only for cake decorating, into piping gel. Place a long, thick stripe of dye down one side of a piping bag. Do this on the opposite for a second school color. If there is a third accent color used, make sure you place the stripes into thirds inside the bag. Fill the bag with white buttercream. Pipe the frosting in a large swirl shape on top of the cupcake. If you are not sure about the decorations for the class, ask a teacher for help. She or he may have ideas that relate to a particular subject matter that students are currently studying. 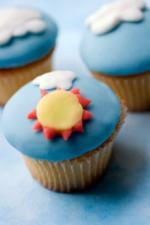 Sometimes, just a simple rainbow, sun or even sprinkles make a cupcake perfect for the school celebration. Whatever the design, 100th day of school cupcakes are sure to put a smile on everyone's face as they bite into the delicious treats.